HA (High Availability) storage is nothing new to business. You need to keep your critical apps up and running and allow it to survive failures. But when it comes to ROBO, the game changes. Cost becomes a major factor in any design decision, and not just licensing, but infrastructure as well. Do you have extra physical space for a storage system? Do you have the infrastructure, power, and cooling to support a new solution? 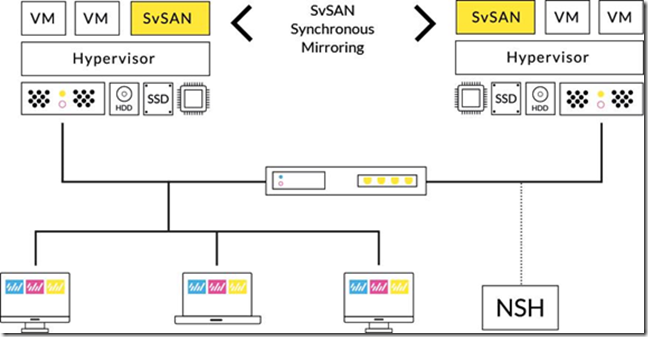 If you didn’t answer a resounding “YES” to all that, this is where StorMagic SvSAN can help! 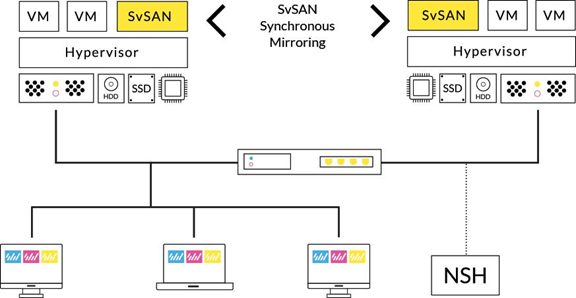 At it’s simplest explanation, SvSAN is a virtual storage solution that can be built inside you existing virtual infrastructure and mirrors itself across multiple nodes to build a highly available solution. But that’s an overly simplified explanation of the product, when you start to dig deeper, you see its capable of so much more. First of all, SvSAN is a lightweight solution. Each node only requires a VM with 1 vCPU and 1gb of RAM. You also only need 2 nodes to get started. You can simply throw 2 servers with some disks in them at a small site and have a fully redundant storage solution without expanding your footprint. If you need some higher end features such as SSD caching or automated tiering, StorMagic has an advanced license to add enterprise features to this offering. Now that’s easy to do if you want HA all in one physical location, but what if you want to step it up and allow your solution to survive a location failure (aka a metro cluster). Well using the witness, you can mirror the data to multiple sites and protect from an interruption of service as well as data corruption. This witness is built with remote links in mind. It can handle up to 3 seconds of latency and up to 20% packet loss. In fact, you only need about 9kbs of bandwidth per mirror. So you can setup the witness in a central location and have it manage all your remote sites over the wan. Probably the coolest feature I found about the witness was that its so lightweight, you can run it on a Raspberry PI! $30 and you now have the witness external from all your mirrors.